Today I am thinking Summer Fashion Week needs to be renamed Fall Fashion Week. A storm blew in last night and it is chilly, windy and rainy. And leaves are falling off the trees and blowing around...it's definitely fall. And being that it is fall, I picked out my best fall outfit to tackle a day of taking care of my baby cutting teeth (it appears 4 are coming in right now). Belt: One of those things so old it feels like your leg...it has just always been there for you! Not that you care, but my shirt actually matches the color of some of the flowers in our garden. I love the color. Maybe that is why I picked out both the shirt and the flowers! You make those jeans look great. I love everything about this outfit - the combination of colors, the fit - I want to steal it from you. you look comfy and stylish. I'm jealous you can wear jeans. It's 92 degress here! Oh I absolutely want this shirt, so great! I am a total jeans girl and love all sorts of shirts that can make jeans look special. Nothing like classic jeans and flip flops with a cute top. Thats basically my uniform. Love the color. I'm loving the photos! And the shirt is great on you: the fit, the color, everything. Yeah I immediately went to the jeans. They are just great. I keep seeing this bright color around. It's a great one for summer! There's a reason that belt's been around your waist forever. It's supa fly! I very much love this look. What a beautiful, yet simple, top! I always like it when Summer brings a Fall day. 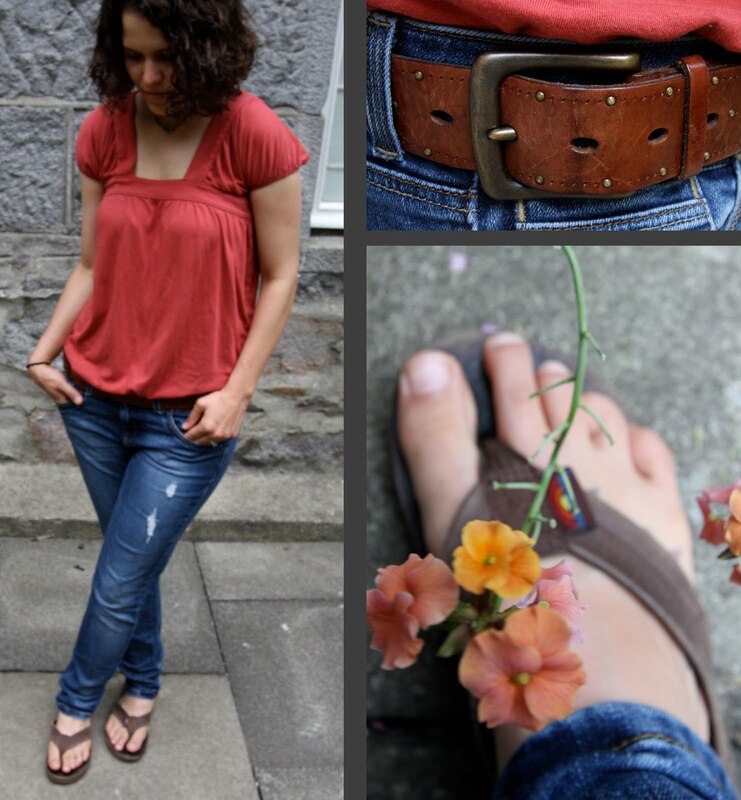 I just found a new-thrifted belt, and am kinda excited for a cooler day when I can don my jeans again. that's a great top. love the color and the way it suits you!